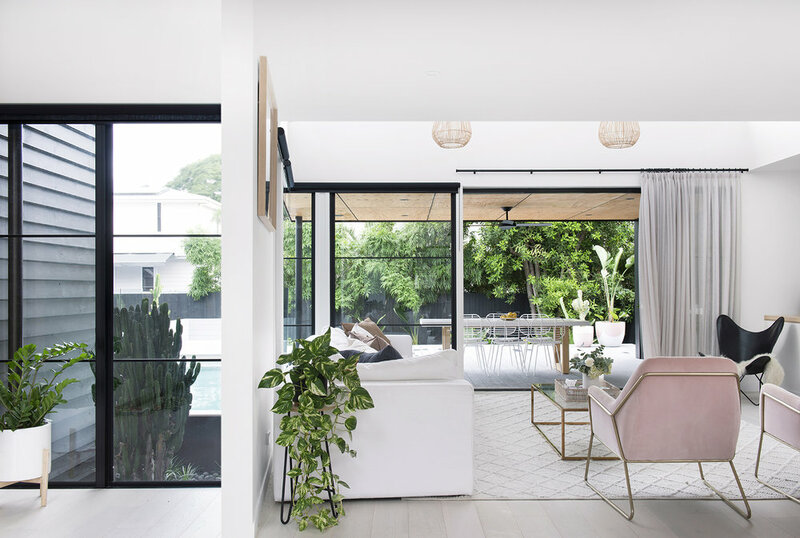 A lucky find, a hassle-free building experience and spot-on styling instincts gave Kayla and Darius Boyd this dreamy home amongst the leafy streets of Brisbane’s north. 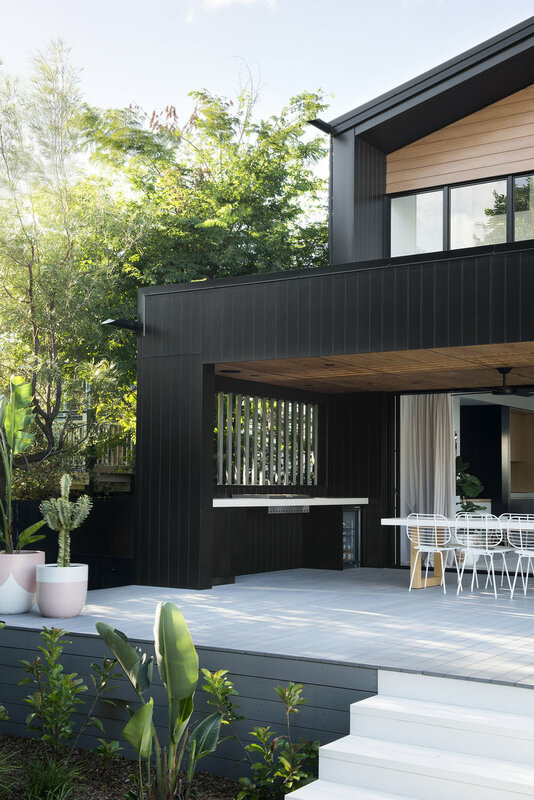 “The only musts were an all-black timber family home – with light timber elements and a void or two,” Kayla Boyd says of the laidback brief that she and her husband, former Brisbane Broncos captain Darius Boyd, gave to their architect and builder. 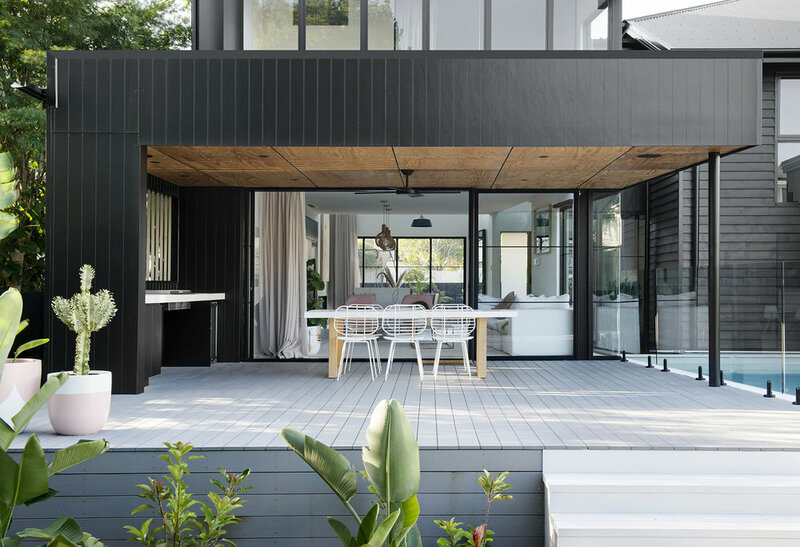 The resulting home ticks all the boxes, with its striking black exterior tempered by warm timber tones. Swathes of glass reflect the Queensland sky and the lush green and scarlet of the neighbourhood’s trademark poinciana trees. 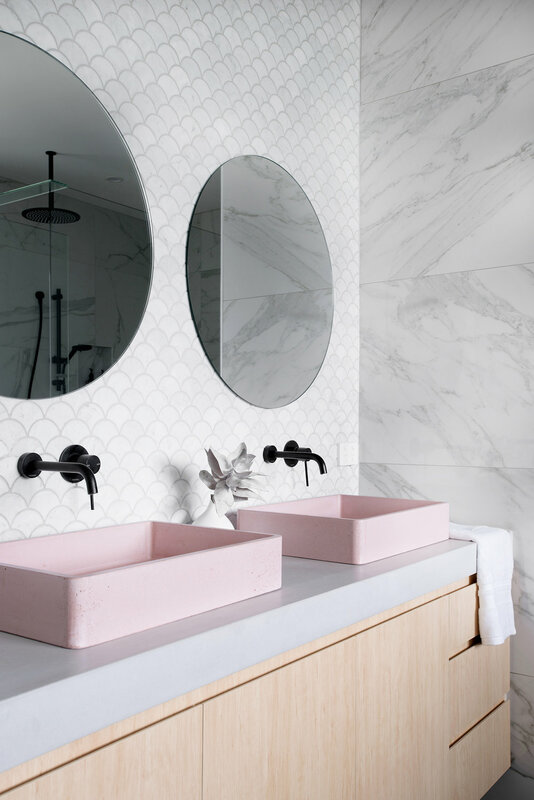 The couple were keen to build in one of the established northside suburbs that border two of Brisbane’s iconic horse racing venues. 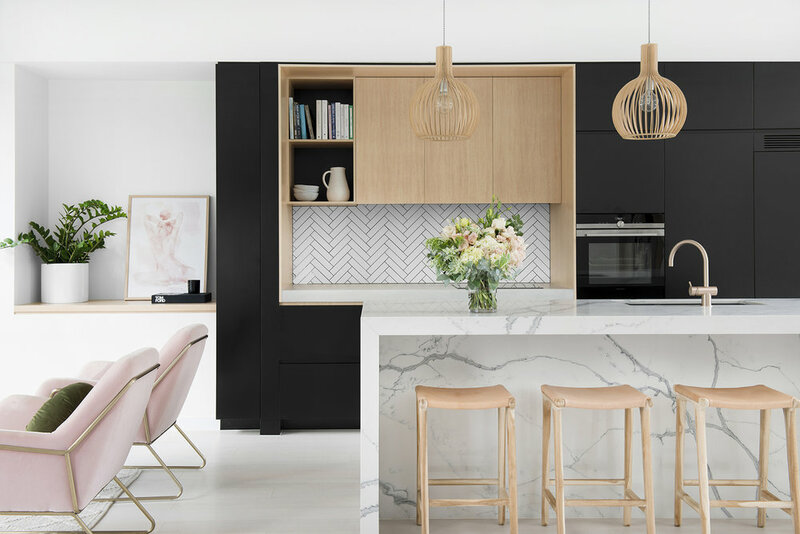 Having found a property – a nondescript, post-war home in Hendra – and been given the green light by their architects, Base Architecture, Kayla wasted no time in securing it. “The kitchen is the hub of our home – it’s where we do a lot of entertaining. It’s functional and very practical for a family. It has everything you need without being overdone,” remarks Kayla. 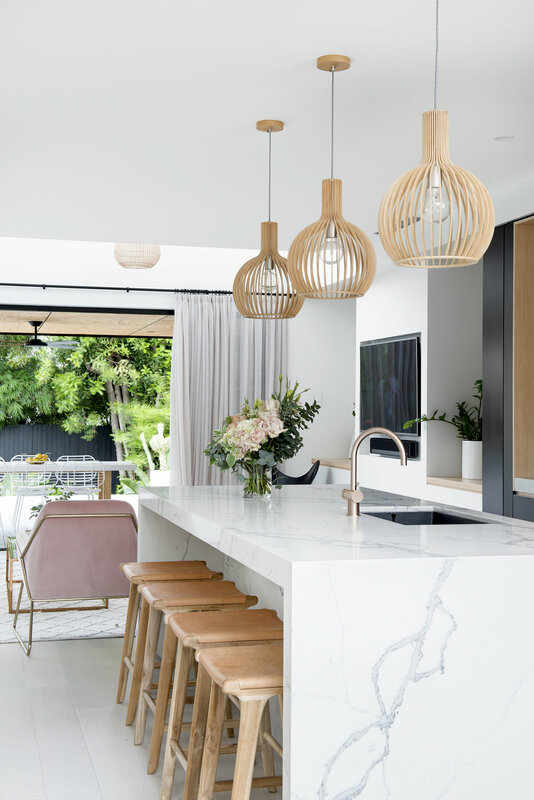 Stools from MRD Home; pendant lights from Beacon; flowers from White Havana. “I love light, lots of glass, and earthy tones with a simple touch of warmth,” Kayla says. Kayla’s work as an ambassador and lifestyle blogger, along with Darius’s football schedule, keeps this family busier than most. Their home functions both as a calming family oasis and a perfect space for entertaining, indoors and out. The building’s design captures plenty of natural light, and its minimal, functional styling choices give it an airy, unfussy elegance. “I love light, lots of glass, and earthy tones with a simple touch of warmth,” Kayla says. The living room is the family’s favourite spot. The overhead void floods it with daylight, and the pool behind Kayla’s beloved white sofa (“It’s huge – truly big enough for an entire family”) throws tranquil blue reflections into the space. “We wanted the pool to be in the middle of the house. We love that you’re able to view it from spaces internally,” she explains. Want to see this home in print? You’ll find the full home tour in our Escape edition, available in newsagents, select stores and through our online shop. Click here to buy.